I'm joining Blue Monday over at Smiling Sally with two blues from the garden. Those same two blues are the basis of my post for Mosaic Monday over at Little Red House. Come join these two great parties. Two blues from my garden this week. Love-In-A-Mist ( Nigella damascena ) is a well known member of the Ranunculaceae family. 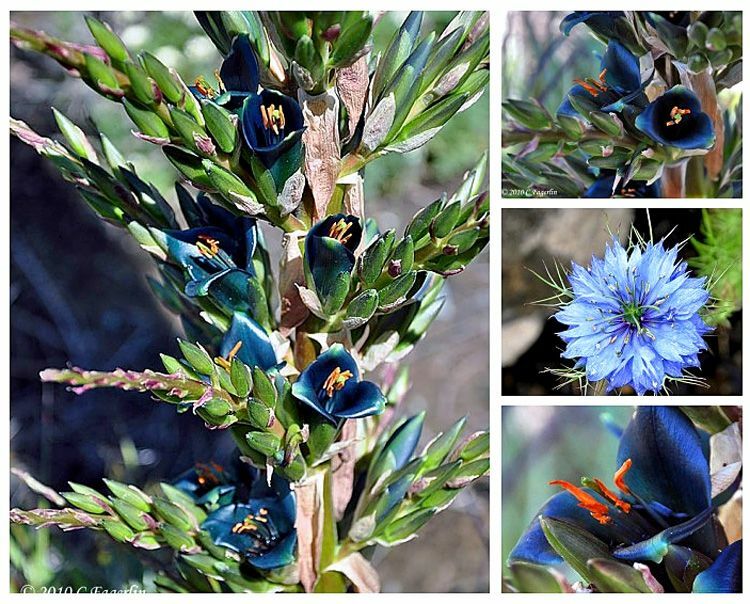 Puya alpestris is a less well known member of the Bromeliaceae family. wow - what unique and beautiful flowers! Those are such pretty flowers! Love the blues! A beautiful shade of blue!! Thanks to all you BLUE lovers for stopping by to see my pretties! They are truly gorgeous in person. I've never seen this color blue in a flower, Candy! It's just gorgeous! Happy Blue Monday. Beautiful! I've never seen those flowers. Those are so unique, never seen them. Thanks for sharing. Gorgeous photos. Such beauty in nature. I wish I had a little of that color in my own backyard. Thanks for sharing. Hi, wow...very beautiful! I hope that you have a lovely new week! Wow! Stunning! I've never seen that color of blue before in a flower. Beautiful mosaic for both Memes! Beautiful blues and gorgeous flowers! I love your mosaic! The flowers are a gorgeous shade of blue. Thank you all for coming by for the Two Mondays! I always have a hard time finding a "blue" topic, but this week I think I hit the jackpot! I do so love both of these blues that are so very different from each other. Hope to see you all again very soon here on TLRT. Thanks Debbie, they are wonderful flowers and reseed so they come up as surprises the next season. Thanks Mary, your party each week inspires so many great BLUES!